﻿ When the American Revolution broke out in 1776, the Dyckman family had been farming upper Manhattan for nearly a century. Jan Dyckman, a German immigrant from Westphalia arrived in the Dutch settlement below what is now Wall Street and soon thereafter purchased several hundred acres far to the north where he established his farm in 1661. As land was added, the Dyckman farm stretched from river to river and roughly from today’s 213rd Street to the 190s. The original Dyckman farmhouse was located near the Spuyten Duyvil Creek, at Manhattan’s northernmost point. As time passed wealthy country squires established estates in the area. The Dyckmans, however, referred to their land as a “farm” and famously raised cabbages and cherries. A second, larger house replaced the original, nearer to the Harlem River. The Revolution would change the idyllic atmosphere of the farm. Jan’s grandson, William, had inherited the land. Known Loyalists, the Dyckmans fled north to Westchester n 1776 when British General Howe moved northward after the Battle of Long Island and took the Anthorpe Mansion in Bloomingdale, just to the south of the farm, in anticipation of the coming Battle of Harlem. 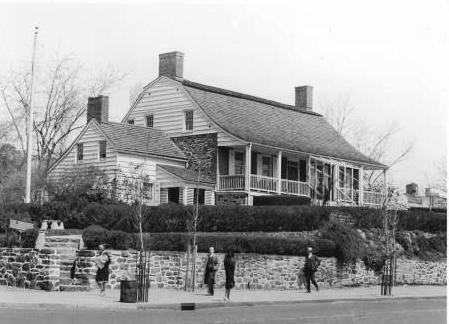 After that conflict, the Continental Army took possession of the Dyckman house for a short time, followed by the British who occupied it until 1783. The Dyckman family returned that year to find that the British had burned their home and their orchards to the ground. Undeterred, William’s eldest son, Jacobus, with the help of slaves, rebuilt between 1783 and 1785. Set on a stony bluff, it was built of fieldstone, brick and wood, with the upper story of clapboard. Characteristic of the Dutch Colonial style so familiar to the family was the high basement and the low-pitched gambrel roof, curved to swing over a full-length porch. Two large parlors and two private bedrooms comprised the main floor, the second story being a large open loft space. A winter kitchen doubled as a heating source while a separate summer kitchen in the garden, with a small bedroom area above for, most likely, a cook, was used in hotter months. The orchards on the 250-acre farm were replanted and in 1787 when William died, the farm had a barn, cider mill and several outbuildings. Jacobus took over the farm, moving his sizable family in to the homestead – eventually totaling eleven children. As time passed, Jacobus – who became New York City Alderman in 1822 -- renovated the home, partitioning off bedrooms upstairs in the 1820s and adding a wing to the north around 1830. The building housed ten people in 1820 including Jacobus (whose wife had died in 1814), three sons, a grandson, niece, a white woman ad freed black woman, one male slave and one freed black boy. Other family members and workers lived in three other homes spotted around the farm. 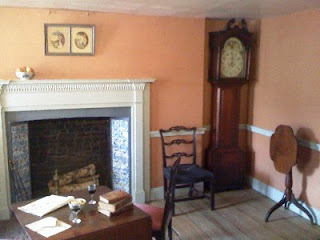 After Jacobus died in 1832, his sons Michael and Isaac lived on in the home for another two decades. 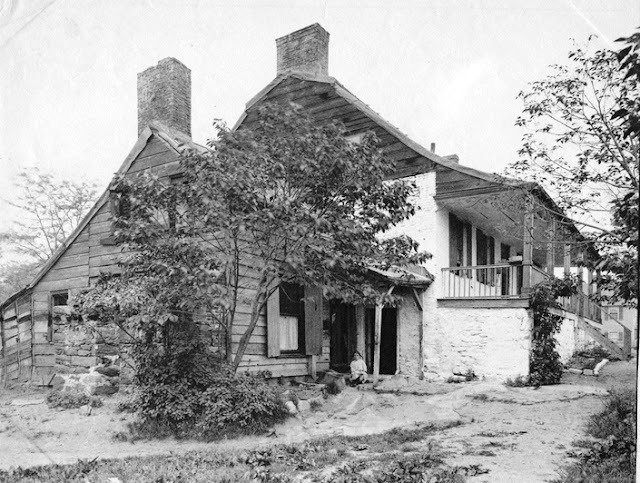 Michael died in 1854 and Isaac erected a more modern home near Spuyten Duyvil where he died in 1868. Upon his death 148 acres of land, divided into 151 plots, was auctioned off. “This is the largest quantity of land ever offered for sale at one time within the City limits,” said The Times. Two years later another 92 acres, divided into 900 lots, was auctioned. 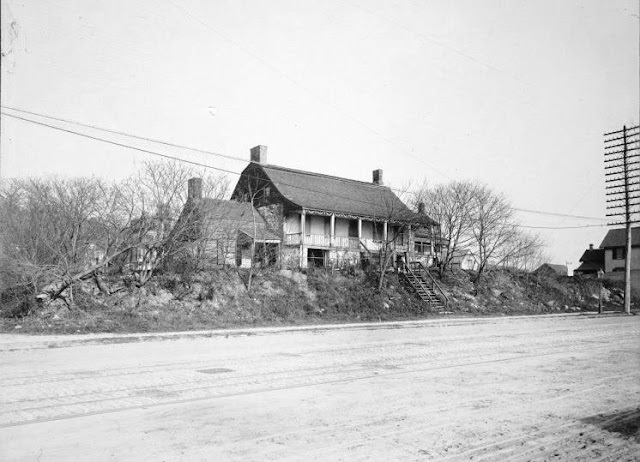 The subsequent lay-out of new streets would place the Dyckman homestead at the corner of Broadway and 204th Street. In the later years of the 19th Century, socially prominent John H. Judge and his wife purchased the house at auction. Although The New York Times remarked “It fell into good hands, for Mr. Judge has guarded the old place from damage as jealously as if it were the home of his ancestors,” period photographs show the building in a state of serious neglect. ﻿﻿ The Judges never lived in the home, residing instead in their mansion at 27 West 94th Street. In November of 1913 the couple announced their intentions to give the house to the Daughters of the Revolution to convert into a museum. The caveat was that the Judges wanted to keep the valuable land on which the home stood – “Mr. Judge, however, has stipulated that the building must be placed on a satisfactory site in Isham Park,” noted The Times. Despite the city’s promises, appropriations for the new site and moving costs were not forthcoming. In May 1914 the Art Commission photographed the Dyckman House as an architectural record, along with other threatened historic buildings. The future of the colonial building was shaky at best. In an eerie coincidence, on December 18, 1914 Winifred Judge and Fannie Dyckman, widow of Isaac Dyckman, both died. Spurred by the death of their mother, Mary Alice Dyckman Dean and Fannie Fredericka Dyckman Welch purchased their family home to rescue it and present it to the city as a memorial to their parents. As luck would have it, Mary’s husband was Bashford Dean of the Metropolitan Museum of Art and Columbia University, and Fannie’s husband was architect Alexander M. Welch. While the sisters gathered family furniture and relics for the museum, their husbands spent over a year restoring the structure. Welch oversaw the restoration while Dean worked on the interiors. The architect carefully removed features not original to the house, such as the 1830s addition. By July, 1916, it was ready for presentation to the city. On the ground floor, a room was set apart to display Revolutionary and native American relics excavated on the Dyckman property and a Hessian hut was rebuilt behind the house, using original bricks. A year later the sisters purchased two additional lots adjoining the house as a gift to the city. “The additional property will make it possible to enlarge the garden, which had been laid out in old Dutch style,” said The Times. While a laudable, early example of architectural preservation, the restored rooms most closely reflected the Edwardian romanticized view of colonial life than the more realistic hardships 18th Century farmers endured. Helen W. Henderson in her 1917 "A Loiterer in New York" was not impressed, calling it an "almost too clean restoration." "Its proportions are unpretentious, for it was a simple farmhouse;" continued Henderson, "but the two Dyckman daughters, who presented it to the city, in 1916, have spared no trouble or expense in outfitting it with family heirlooms and Revolutionary trophies found in the neighbourhood, and in making the house as homelike and intimate as a public museum can hope to be." Controversy swirled around the museum when in 1918, while the U.S. was embroiled in the First World War, German-born Park Commissioner William F. Grell abruptly dismissed the curator and another employee and replaced them with Captain Frederick Hensler and his wife “who are of German birth, but naturalized here,” according to The Times. The newspaper went on to list Commissioner Grell’s memberships in German clubs and societies and lament the “precarious circumstances” of the fired employees. 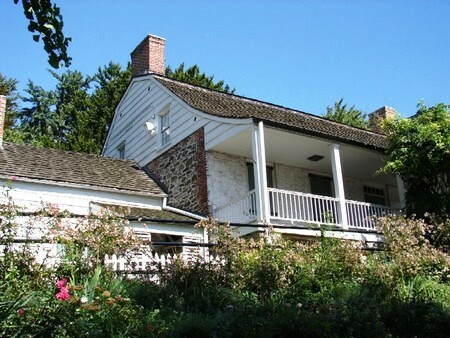 Today the Dyckman Farmhouse Museum is owned by the New York City Department of Parks & Recreation. A member of the Historic House Trust, it is both a New York City Landmark and included on the National Register of Historic Places. Nestled among the modern buildings of Upper Broadway, the charming 18th Century house is both a surprise and a delight. Love the progression of the remodel depicted in the photos of the farmhouse. Hi. The Dyckmans were Patriots, not Loyalists. Three out of four of William's sons fought with various militias and one, Abraham, was killed while fighting for the Westchester Guides. Here is a link that goes into great detail regarding their service. http://notorc.blogspot.com/2010/08/all-brothers-were-valiant-one-mans.html. I also read it in another account. Thanks. Absolutely love your site!